My first face-to-face introduction to the solidarity economy in Southern Brazil was a visit to a recycling cooperative. Through hard work, the 16-member team had arranged for mountains of garbage to be dumped in their yard. 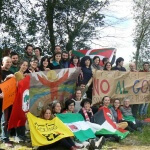 Most of the coop members had worked alone previously, going street to street looking for plastics, paper, glass and metal, and then trying to sell their sorted waste to local companies. April 16, 2016, was a day for celebration. 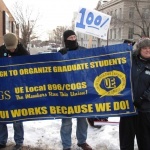 It marked the twentieth anniversary of the union certification election that transformed a home-grown organizing campaign among graduate employees at the University of Iowa (UI)—the Campaign to Organize Graduate Students (COGS)—into Local 896 of the United Electrical, Radio, and Machine Workers of America (UE). Jockeying to get funds for a neighborhood playground or clinic is nothing new. But in the absence of an organized procedure, cities tend to respond to the loudest and most organized groups, often a community where people have education, steady jobs and time to lobby. Should Right to Work Laws be Legal? If ever a law was mislabeled, it is the Right to Work legislation. 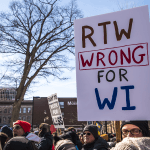 This anti-union contagion has spread through state legislatures like an ever growing fungus (witness Wisconsin). Pro-business conservative nabobs are making the argument that more business means more jobs and Right to Work laws promote business development or relocation. 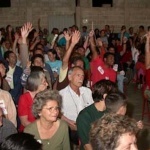 This is the first article in a series on Canoas, Brazil and its experiment with radical democracy. Here in the states, we know what it means to see our democratic rights attacked. But do we have a vision of what an expansion of democracy and popular participation in government might look like? French workers are fighting to maintain their 35 hour work week. Adopted in February of 2000, as part of the platform of France’s Socialist Party, it became effective in 2002. Now, despite no ill effects in productivity the MEDEF, or the “Movement of the Enterprises of France,” which is an employer’s union, is pressing for a return to the past. 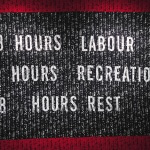 Is It Time for a Six-Hour Work Day? A 2014 Gallup poll shows Americans work an average of 47 hours per week. But should the work week be 30 hours? And should this is considered full-time employment? Why should this be done and what are the implications? 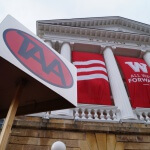 After briefly skimming over the potential effects of the proposed restructuring of pay for graduate assistants, I found myself jadedly stunned by the UW-Madison administration’s most recent attack on the quality of higher education, specifically with regard to the Humanities, at Wisconsin’s prized flagship and world-renowned institution.